Researchers at the University of Southampton are to study why some people are more likely to develop asthma. The team will analyse a particular gene called ADAM33, which is associated with the development of asthma and airway ‘twitchiness’, a common feature of the disease. ADAM33 is also thought to play a role in changing the airway architecture in the lungs of young children, possibly even before they are born. Lead researcher Hans Michel Haitchi, Associate Professor in Respiratory Medicine at the University of Southampton, says: “We know that ADAM33 makes an enzyme, which is attached to cells in the airway muscles. In asthma, it has been found that this enzyme goes rogue from these cells and higher levels of the enzyme are associated with poorer lung function. We think that when it detaches it causes problems by affecting cells that shouldn’t come into contact with it and this results in subtle changes in the airway wall – called airway remodelling - involving over-growth of cells that cause the airways to narrow, among other asthma-associated changes. We also think that this airway remodelling can occur before birth, which is something we will focus on in the study. The study, funded by the Medical Research Foundation and Asthma UK, will analyse mice born with or without the rogue ADAM33 enzyme after exposing them to dust allergens or causes of allergic inflammation such as the Interleukin-13 protein. This will enable the team to understand how the rogue enzyme might cause airway remodelling, and interact with allergen-induced lung inflammation in early life. New genetic methods to study the lungs of these mice will be used that will allow discovery of new asthma disease-associated genes and their proteins that play a role in the development of asthma. 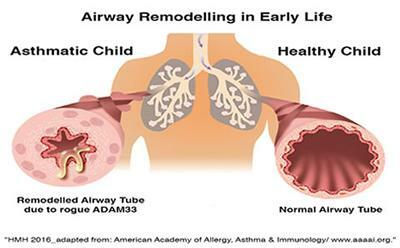 Furthermore, samples from young children whose mother has asthma or children who have asthma will be studied for the faulty ADAM33 enzyme and how this is associated with altered airway structure. Some of these samples will be collected at the National Institute for Health Research (NIHR) Southampton Respiratory Biomedical Research Unit and the NIHR/Wellcome Trust Clinical Research Facility at University Hospital Southampton NHS Foundation Trust. Professor Haitchi adds: “Understanding how the ADAM33 enzyme causes airway remodelling before birth and the responses to environmental triggers such as allergens are the first steps in developing a treatment to stop this from happening. Airway remodelling reduces the ability of the lungs to function, and is not prevented by current anti-inflammatory steroid therapy. Therefore, stopping this would prevent a harmful effect of asthma for many of the 5.4 million people in the UK with the condition."